Busan One Asia Festival: Opening Concert 2017. Part 3. The Busan One Asia Festival Concert was an arena sized star studded event and parts 1 and 2 only covered the pre concert and first half. Here I’ll be describing the second half. No matter how I write about it, just imagine that plus a bit more. There’s really no adequate words to describe the atmosphere of arena concerts, especially when the concert has so many well known Kpop groups and stars. After Black Pink’s performance, see part 2, the atmosphere changed when GFriend came on stage and sang Summer Rain. In counterpoint to Black Pink they were sweet and innocent, perhaps even a little bland, and I think it would have been better for them to have been placed in a different order in the lineup. Their second song, Love Whisper, was much more engaging. Then it was time for one of my favorite groups, BAP. You could tell a lot of other fans liked them too by the loud cheers and screams. Wildly waving Matoki lightsticks could be seen throughout the arena. They sang Honeymoon and gave a solid performance with a lot of understated power. At times it looked like a high class modeling shoot as they owned the stage and commanded the audience’s attention even when standing still. They looked so good dressed in suits. Honeymoon is one of my favorite songs from 2017 so I was stoked to see it performed live. Next on stage were Nu’est for their second performance of the night. This was so much better than the first. They sang Where You At and gave a much more confident and polished demonstration of their talents. An older man then sang a popular Busan song which resonated with the locals, but even with an orchestra and knowing that, I was too cold to enjoy it. Fortunately Wanna One came back on stage with Energetic which soon had the audience moving again. Their song was catchy and upbeat and it was hard not to bounce along to it. I’m glad I got to see them since they have such a short ‘shelf life’ and they were definitely worth seeing live. They gave a good performance and had a lot of support from their fans. As Wanna One left the stage we began to hear weird sounds and soon enough we realized who it was. It was NCT 127 with Cherry Bomb. Not particularly a favorite of mine I have to say that seeing the live performance completely changed my mind. They just owned it, the dancing was fantastic, crisp, clean, and flawless, and the singing wasn’t bad either. Cherry Bomb can seem quite repetitive, but I hardly noticed that as I was fixated on their intense performance. It was probably the best of the night. APink was next with Five. They were perky, confident, and not too sugary sweet or cutesy. They made a point to cover the whole stage and split apart to walk as far out towards the audience as the could. This was much appreciated by the fans and was a nice touch. They were the only group to utilize the walkways during their performance, (see last minute of https://www.youtube.com/watch?v=wJ3WUZVu5E0 ) and I commend them for doing so. The wind was still swirling around the arena and they must have been really cold in their outfits but they didn’t show it, or the fact that they have had so many bomb threats, including one for this very performance. I can see why their fans like them. Got7 came on stage to loud screaming which showed how pleased their fans were to see them finally in front of them. This was the third time I’ve seen them live and as usual they didn’t disappoint. They are fantastic and dynamic live performers giving their all for every song. Their first song was Never Ever, followed by You Are. Their dance moves were crisp and clean, with good lines and good footwork. Their voices harmonized well and complemented each other. 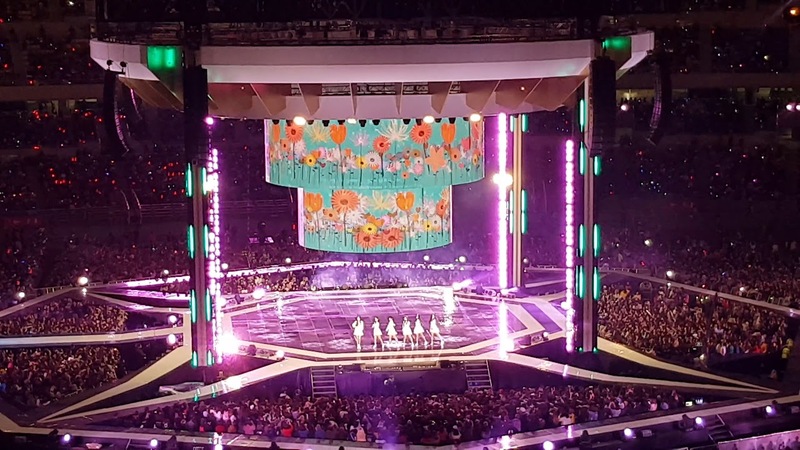 Got7 understandably received a lot of love from the audience, but nothing like the reception for the last group of the night…. It has been 20 years since the heyday of Sechskies but unbelievably, even after disbandment and a second debut, they had the largest fandom at the concert. The ‘yellow ocean’ took up a large part of the arena with yet other fans scattered throughout. At that moment the happiest people that night were the yellowkies, they had supported all the previous acts but now it was their turn. The fanchants could be heard even in the vast expanse of the arena and the yellow jackets and lightsticks were indeed moving like the ocean. Sechskies, looking great for their age, absolutely glowed with happiness. It was quite an emotive time seeing how much love they were receiving from their fans. They sang Three Words + Ment + Something Special and had the crowd in the palm of their hands. They moved about the stage, but consistently ended up facing their fans not the ‘front’ of the stage. They thanked the audience and their fans and were having so much fun they had difficulty leaving the stage. Their pleasure in being on stage made all of us feel happy too. They took selfies of themselves with their fans in the background and never once stopped smiling. As the evening ended we unfortunately had to rush back to the tour bus, but on our long walk up the steep hill past all the fan club buses, we could still hear the occasional loud roar from the arena so I don’t know if there was any kind of encore, if so we sadly couldn’t linger to find out. If you ever get the chance the Busan One Asia Festival, held once a year for a week, is well worth attending as it has lots of opportunities to see Kpop groups as well as lots of other festival type events. You may also enjoy part 1 and part 2, plus A Visit To The Show, (SBS Music Show). Please do not copy or use without permission and accreditation. All photos to original owners. Unless noted otherwise Elizabeth & Debora Marzec. ← The Kpop Jacket Turns Four!